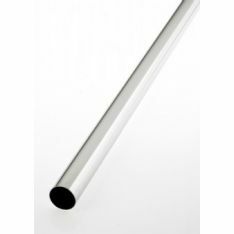 Our tube and fittings range offers a miscellanea of fittings for bathroom rails, wardrobe rails and towel rails. Among these we have available chrome hanging rails, brass hanging rails, chrome wardrobe sockets, brass wardrobe sockets, towel rail ends, brass towel rail centres and chrome wardrobe rail centres. In case you require a clothes airer or drying rack, we stock a wide range of indoors and outdoors airers. Firstly, we have a wide selection of rotary clothes airers ideal for outdoor clothes airing, including the weatherproof Hills Portadry 4 Arm 45m Rotary Clothes Airer which has easy to clean lines and offers an easy to raise mechanism. Within our A-frame airers range, we stock the Minky Over Bath Airer, which is a compact clothes drying rack to be used on top of the bath. This clothes airer is adjustable for any sized bath and it offers a drying space of 9.5 metres. Our most compactable range of clothes airers are the pull-out airers, that are easily installed and can be used in outdoor balconies or inside the home. The Leifheit Telegant 70 Tidydry Clothes Airer offers 60 cm of drying length and has a high capacity load. Lastly in our sundry items range, we offer a wide range of screws suitable for a large selection of jobs you might require doing.